This deck and porch project was unique in many aspects. The scale and style of the multi-level home called for unconventional planning and execution. We built a truly unique and beautiful outdoor living space, which specifically accommodated the homeowners’ requirements, and allowed us to demonstrate why we are a leading Olathe deck builder. We had to first consider the style of the home and ensure that our deck and porch additions complemented the Victorian design. It is always important to create a usable space, but also one that yet new, appears original to the home. Of further importance, was to produce a high-end product to suit the home’s beautiful details. One of the ways we achieved this was by using 10”x10” trimmed support columns to create a bold, stately aesthetic. Additional details in the decking and the addition of skirting also helped us produce a truly custom outdoor living space. AZEK composite decking was the choice product for this project, in two complementary warm walnut brown tones. 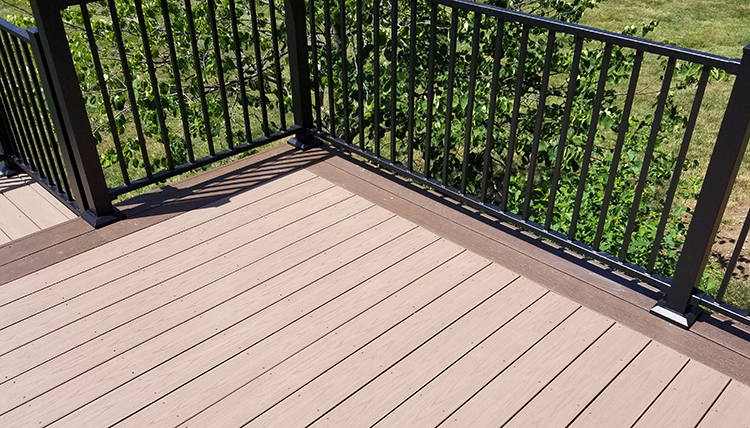 Autumn Chestnut, a softly-muted brown, was installed as the main decking boards color. Acacia, a more richly-toned and saturated brown, was utilized as parting boards to eliminate perpendicular seams and as ribboning for a more custom, visually appealing finish. As a premier AZEK deck builder in Olathe, KS, we can design such custom options that will set your new deck apart. We installed black low-maintenance aluminum railings by Fortress Railing Products, in a slender-profile design, which offers an unimpeded view from the deck. Lighter colors tend to draw the eye directly to the railings, in high contrast with their surroundings. We aimed to achieve the opposite effect, inviting us to see beyond them. We chose to build the screen porch with an open gable to encourage natural air and light to flow throughout the space. In designing the porch roof, we had to consider the arrangement of the home’s many rooflines, and more specifically the porch’s roofline, as to not block the view from the third-story windows above it. Interior porch ceiling detailing includes tongue and groove pine to achieve a custom, sophisticated finish, where no detail was overlooked. Smart Siding was applied to hide unsightly areas beneath the deck. Also unique to this project, was a complex second-story bump-out roof connection. Many times, contractors might disqualify a project due to the difficulty of the connection of the new structure to the existing home. We met this challenge head-on and achieved a seamless result. As the second story is the main living level of the home, it was imperative that we connected the outdoor living space to that level. This will allow the homeowners to carry food and beverages in and outside without trudging up and down the stairs. Ease of access will encourage the them to utilize their outdoor living space much more than they might if scaling stairs to carry supplies was required. At Archadeck of Kansas City, our goal is to always meet the challenges of any project, providing innovative solutions to specific design and building requirements. We believe this beautiful project is a testament to that statement. Do not be dissuaded if another contractor says, “It can’t be done.” We can help you attain the stylish and usable outdoor living space you have always dreamed of having. If you are considering adding a new outdoor living space to your Kansas City area home, give us a call for a free consultation (913) 851-3325 or drop us an email. We look forward to working with you to design the ultimate outdoor living space for your home.